Never Enough Nails: Lynnderella Friday, Vol. 39- Finally Spring!! I feel like it's finally spring here!!! Wohooo!! The last 2 days have been sunny and got up into the 50s, so it's refreshing for sure! I have some spring-y, refreshing Lynnderellas for your viewing pleasure today, starting with Lynnderella Morning Glory. Lynnderella describes this beauty as a "multishimmered thermochromic vivid periwinkle that shifts to pale blue violet. It also contains iridescent blue flakes with a sprinkle of rainbow dust". The cold shade is just like the color of Morning Glory flowers and the warm shade is a beautiful powdery blue. The warm state really shows off those iridescent blue flakes nicely (you can see one on my ring finger). This is two coats of Morning Glory. The formula was a little thicker than most Lynnderellas. I had to apply a very thin first coat, and then allow it to dry completely before adding a second coat. It's pretty smooth with one layer of top coat. Lynnderella Honeydew Froth is another new LE that is perfect for spring. It is the exact color of a juicy honeydew melon, with minty green and pink shimmer. Makes me want to eat a yummy summer fruit salad! This is three thin coats of Honeydew Melon. It was a little sheer on the first coat, but built up with the second and third. The formula was good otherwise, nice consistency. 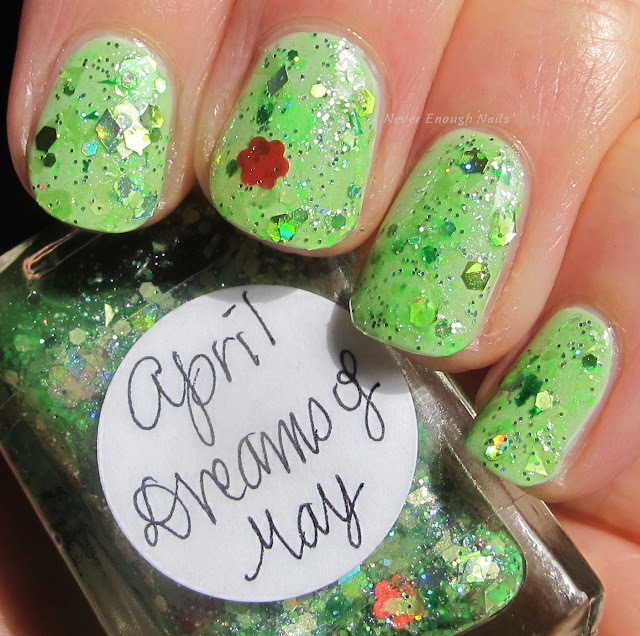 Lynnderella April Dreams of May is an older LE that I just got fairly recently. It's my favorite kind of Lynnderella- a chunky glitter topper with all sorts of different glitters thrown in. It has nice red flowers, metallic green hex glitters, silver holo diamonds, and small silver glitter woven in throughout. The base of this one a fresh green tint with silvery shimmer. This is two coats of April Dreams of May over OPI This Cost Me a Mint (from the SoftShades collection- review coming soon!!). It was easy to apply with the dabbing method. 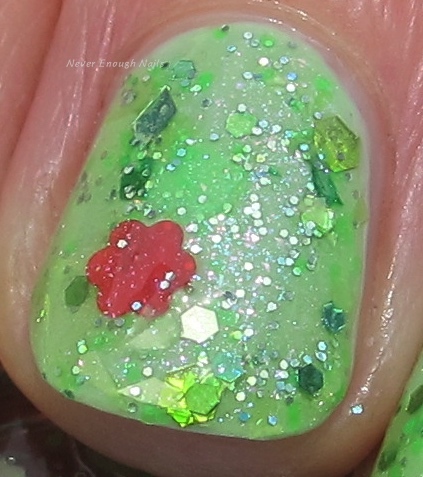 This is with layer of top coat, but if you want it to be totally glassy, you might need two layers. 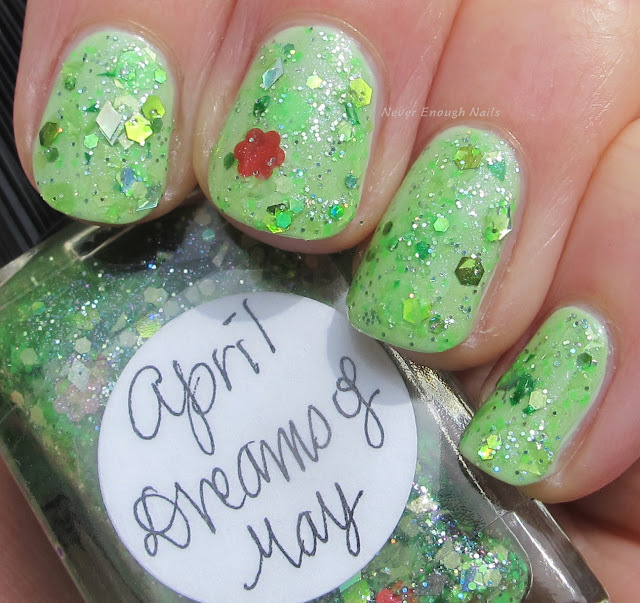 April Dreams of May is not currently listed on lynnderella.com, but it was there just sometime last week, so keep an eye out! The other two are available now! You can also always email Paul at lynnderellalacquer@gmail.com to see if something is available.